One of the things that bothers me most about the homeschooling community is the idea that it provides an elite education and that our goal as homeschooling parents is to produce elite leaders. By elite leaders they mean children who are academically advanced (graduating to post-secondary early or with special honours or scholarships) or children who are active leaders in their community either through entrepreneurship or by having accomplished something in their teens that is noteworthy (published their first novel, presented a local Ted talk, etc.) Of course this not unique to homeschooling parents. Parents of public and private schooled children are also striving for these things. There is nothing wrong with these goals in of themselves if they are the goals of the child. 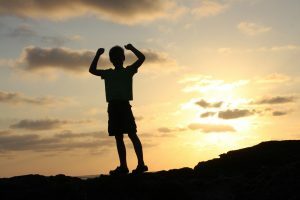 If the work that the child is accomplishing flows from their own personal integrity, resilience, passion and excitement, and the work actually brings them fulfillment and rest, then it is of value to the child. But there is also nothing wrong with children who struggle at their academics. There is nothing wrong with children who spend their adolescence quietly figuring out who they are and what is important to them in life. There is nothing wrong with teenagers who haven’t accomplished “big things” and are still figuring out how they want to wear their hair. Maturity isn’t defined by when you finish school, or how well you did academically, or what “great” things you have accomplished by the time you are old enough to vote. Yes, we as parents all have hopes and dreams for our children. Most of us, rightly so, hope that our children will be happy when they are adults. But we also have other agendas, some hidden, some not-so-hidden. We want for our children to have good jobs – the definition of “good” usually aligning with “well-paid” and “personally fulfilling”. We want for our children to excel in an area, like music or science or sport, and perhaps even be top of their field. We want for our children to have partners and children who are also successful – doing what is supposed to be done, hopefully at an earlier age because somehow that is a marker of success in our society. This focus on success frustrates me for two reasons. The first is because we live in such a consumerist society that we equate success initially with academic and then with financial accomplishment. Those children who read early are more successful than those who don’t. Those who graduate top of the class are more successful than those who don’t. Those who make more money are more successful than those who don’t, often regardless of how that money is made. The second is because it doesn’t address what is truly important for children when they grow up. None of these successful accomplishments actually indicate successful maturation. None of these accomplishments tell us how mature, resilient, creative, or socialized an individual is. We all know people who are financially successful but injure people in various ways to earn their money. We all know people who are widely popular but end their lives in suicide. We all know people who have won awards for their work, but never seem personally fulfilled with them. That is because these markers of success have nothing to do with maturation and it is this maturation that I want for my children. Yet we live in a day and age where maturity is not only misunderstood but often not even desired. And this is not only to our children’s detriment but to our society’s and ultimately our entire world’s. I desire for my children to be mature individuals when they are grown. This is not the same as happy. Happy is a passing feeling, and we live in a world where lots of bad stuff happens. While I do want for my children to experience great happiness in their lives, the only way for them to do so is to be resilient. I want for my children to be adaptive – to be able to encounter the difficulties of life and then respond and adapt to them, to be able to figure out how to get back up when the world knocks them down. I also want for my children to be emergent – to be able to be true to themselves. Each of us is endowed with a unique set of ideas, thoughts and giftings – that part of us that makes us uniquely us. This is not the same as being the best at something. This is about being the best at being you. I want for my children to know and understand themselves and be able to express their individuality, regardless of whether it earns them money or fame. I also want for my children to be able to see and honour that unique individuality in others, even when it differs from theirs. I want for my children to be integrative – to express and feel love for others without losing sight of themselves. I want for my children to feel compassion for those who are struggling and to protect those that are vulnerable. I want for my children to be able to balance the deep nuances of a complex and complicated world and be able to navigate it with grace and ingenuity. 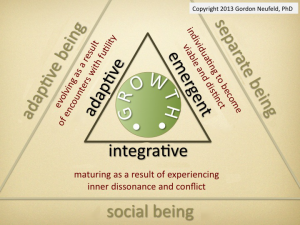 Dr. Gordon Neufeld, in his course Helping Children Grow Up, identifies these three markers – adaptation, emergence, and integration – as the markers of maturity. These are the three things our children need not only to survive in the world but to flourish as individuals and contribute to building a better world. Without adaptation, an individual cannot grow and change. They become stuck in one way of being. Without emergence, an individual never feels entirely true to themselves. There is a hole inside them that they will fill with other things, some rather benign, some very destructive. And without integration, there cannot be peace – no peace of mind, no peace in relationship, no world peace. I try to hold onto these three things when faced with a world that is intent on raising “successful” but often immature people. I do confess that I wanted children who read early (they didn’t). I wanted teens who did something amazingly exceptional (none of them have yet to cure a disease or solve global climate change). I wanted children who were always happy (they weren’t because the world can be a crappy place). What I got were adaptive children. They cry deep tears of transformative grief and they are able to change themselves when the situation cannot be changed. I have children who are wildly emergent. They are confident in who they are and they are constantly creating art and music that serve only to bring them delight. And I have children who are integrative. This allows them to live together peacefully in our small home, to navigate fulfilling romances, and to work well with others at school, at work and at play. These are the things that define my children as successful. These are the things that every parent should be hoping for and working towards. If you want to know when new articles are posted, please sign up for my newsletter here.